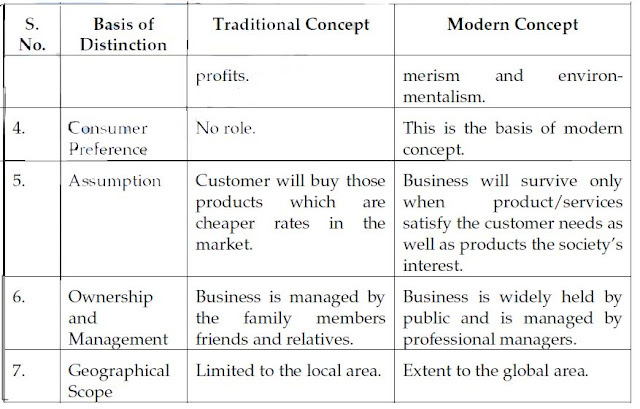 Q.1 Discuss the different concepts of Business that have emerged so far in World. 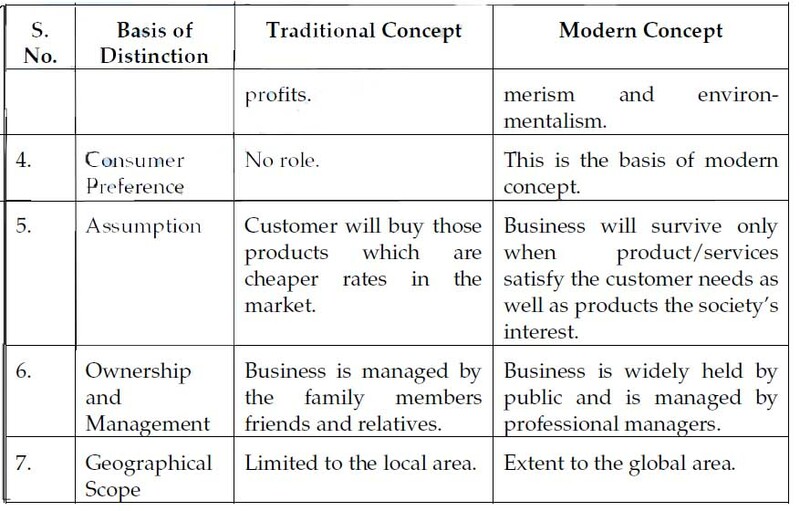 Also distinguish between the Traditional and Modern Concept of Business? Profit Oriented Concept of Business : In the early age of the business, it was conceived to be a wealthy producing or profit making economic activity. Any human activity directed towards the acquisition of wealth or earning profit through production or exchange of goods was treated to be a business. 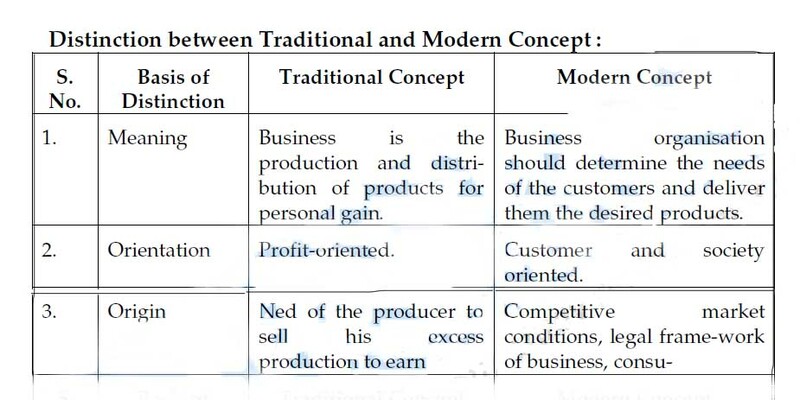 The profit oriented concept is also known as traditional concept of business. When people started doing business by forming organization, than business used to be conceived as an organization organised and operated to produce and provide goods and services to society under the incentive of private gain or profit. (i) The sole objective of the business is to earn profits by production and/or distribution of goods. (ii) Customers will buy the products that are available in the market at the most competitive rates. (iii) There is hardly any need to think for customer service and satisfaction for running a business. Customer Oriented Concept of Business : This concept has came into existence around 1950’s and gained momentum during the 1960’s and 1970’s. The business organization began to think that business should earn profits through service and satisfaction of the customers Organization were forced to regard customer as the king of the market. (i) Business organizations should produce and provide the goods/ services that are needed by the customers. (ii) The products and services provided by the business should satisfy the needs of the customers. (iii) The business should earn the profits through the service and satisfaction of the customer. Q.2 What do you mean by Business. 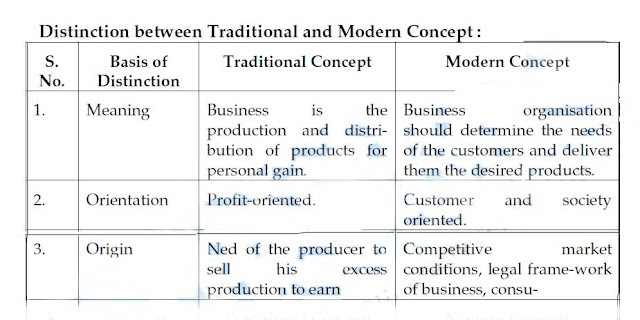 Explain clearly the role of Business in the Modern World. Ans. : The literal meaning of the term business is the ‘state of being busy’ or business. But when the term is used in relation to the business world, it means much more specific. All the definition to business may be classified under the following three categories. Traditional Definitions : Traditionally, business was regarded as the institution organised for production and /or distribution of goods/ services for earning profit. Customer Oriented Definitions : Businessmen began to think about earning profits through customer service and satisfactions. Hence the academicians and professional the term business accordingly. · It helps in accomplishing their objectives. · It helps in acquiring the knowledge and letter skills. · Business persons may go for expansion and diversification of business. · They may by more emphasis on customer satisfaction. · Create and maintain better relation with wholesalers, dealers, retailers, and other merchantile intermediaries. · Easily innovate and develop new product. · More responsible to the society. · Optimum utilization of resources in the most effective and efficient way. · Enjoy a very high societal status. · Helps them to get right the product. · It ensures better facilities, better deal and after –sale services. · Customers also get benefits under loyal customer schemes. · Customer gets better products and services at lower costs. · Customer also gets the joy of larger choice. · Members of society get better products and services at reasonable rates. · Better standard of living and quality of life. · Security and welfare of their old age and raising days. · Eradicate poverty, disease, ignorance, social evils through social welfare programmes. · Planned development in the economy. · Efficient and effective utilization of national resources. · Ensures regular process of production and distribution of goods and services. · Increase and provide employment opportunities. · Foreign exchange reserves by way of exports of goods and services. Q.3 What are the forms of Business Ownership? State the main features of all of them. (i) Sole Proprietorship: Sole proprietorship is a form of business organization which is established, owned controlled and usually operated by an individual and that individual also assumes all the risks of the business and entitled to all the profits made from it. (ii) Partnership: A partnership is an association of two or more persons who agree to carry on business for earning and sharing profit among them. (iii) Hindu Undivided Family : When a Joint Hindu Family carries on a business, it is called Joint Hindu Family Firm. The members of such firm are called co-partners Joint Hindu family consist of all persons lineally descended from a common ancestor and includes their wives and unmarried daughter. There are two schools of Hindu law namely ‘Dayalhagya’ and Mitakshra’. According to ‘Dayalhagya’ school of Hindu law, each son acquires an interest in the ancestral property only after the death of his father. According to Mitakshra school a son acquires such interest by birth or by adoption. (iv) Company: Company is a voluntary association of persons formal and registered under the present Companies Act, or under any previous law. In the eyes of the law, it is an artificial persons having separate entity from its members, with perpetual succession and a common seal. The capital of the company is divided into transferable shares and shareholders are called members. · At least seven persons in case of public company and two in case of a private company. (v) Cooperative Organizations: A co-operative society or organization is one which has been voluntarily formed by some persons for the promotion of their common economic interest. Public Enterprises: A public enterprise refers to an industrial, commercial or service enterprise which is owned and controlled by the government or by public authority/ government organization for providing goods or services to the public. (i) Departmental Organization: Departmental form of organization is the oldest form of organizing public enterprises. Under this form of organization, an enterprise is put under the control of a department. Such department is leaded by the concerned minister. Example:- Railway Department. · Managed by a department of the government. · Minister-in-charge of the department has the direct control. · Financed by annual appropriations. · Wholly owned and financed by the government. · Employees are civil servants. (ii) Public or Statutory Corporation : A public or statutory corporation is a body corporate incorporated under a special Act of the Parliament or state legislature for the purpose of carrying on certain industrial or commercial activities or rendering specific type of services. · Incorporated body under a statute enacted by a parliament or state legislature. · Artificial person having all the rights of a person but not of a individual. · Separate legal existence from the government. · It can sue and be sued by the government. · Wholly owned by the central and/ or state government. · When ownership is shared by private entrepreneurs it is said to be a mixed corporations. · It can enjoy independence in the matters of its financial management. · Employees are not civil servants. · Autonomy in its operation. · Accountable to the parliament and/or state legislature. (iv) Government Company: Government Company is one in which not less than 51% of the paid-up capital is held by the central or state government; and/or by the government company and/or by any public corporation, authorities. · It is registered or an incorporated body under the Indian companies Act, but all the provisions of the act will not apply to it. · Majority of shares are held by the central government on by the state government or by any public corporation/authority or government company.